To search for specific keywords within all of the Archived News Items for 2008, you may initiate a Search by holding down the "Ctrl" key while pressing "F" on your keyboard. Whether the needs are for on-the-go portability, viewing street signs, storing class notes, reviewing important documents, reading the morning newspaper or sharing information the Optelec FarView puts freedom and independence in the palms of the user. Vista, CA, November 28, 2008 -- Optelec, the world leader in innovative and assistive technology for visually impaired and blind people, announced the release of FarView, a portable and powerful magnification solution that redefines how low vision users are able to access, store, review and share information. The unique design of the Optelec FarView and incomparable functionality of near and distance viewing sets a new standard for other portable and desktop devices currently on the market. Using a centralized, auto focus camera and six different viewing modes the FarView allows the user to view from a distance as well as up close. Viewing notes on the board, reading the menu at coffee shops, and traveling independently has never been easier! The FarView enables the user to store the data for up close review in more detail at any time. Capture a complete document or multiple pages of a book or magazine. Up to 100 images can be stored on the device and accessed at any given moment. Stored images can be adjusted to the users needs via an integrated menu. Ergonomic scrolling buttons help the user to navigate through any document easily and comfortably, with an auto-scroll function which brings the user back to the beginning of the text line within a snap. Adjust images and text to the needs of the user though rotation, picture alignment, contrast and brightness settings. Also, FarView offers the user flexibility to connect to an external monitor or PC, encouraging the user to access printed text and photos comfortably and efficiently, and share this information with colleagues, friends and family. "We are ecstatic to be bringing a product such as FarView to an industry thirsting for innovation," states Michiel van Schaik, CEO of Optelec Holding B.V. "We at Optelec are 100% committed to combining the intelligence within a product with a flexible, powerful design in order for the consumers of our products to exponentially receive more functionality for the money that they spend." Optelec expects to be delivering FarView to users in January, 2009. Contact your local Optelec distributor or sales office for more information and pricing details. "Improving the quality of life of visually impaired and dyslexic people, reaching out with simple and effective solutions," Optelec was founded in 1985 and is recognized as the worldwide market leaders in providing innovative solutions for the blind, visually impaired and learning disabled. The company's flagship ClearView+ line has led the industry in high quality, innovative products that effectively improve the daily lives of the visually impaired. In January 2007, Tieman U.S., Holding Company to Optelec U.S. spun off ShopLowVision.com (http://www.ShopLowVision.com) and LowVision.com (http://www.LowVision.com) as a sister companies, providing the one-stop-shop for optical, non-optical and daily living aids products solutions and education for eye care professionals and consumers. Visit us at http://www.optelec.com. Welcome to another jam-packed newsletter full of lots of exciting information about Flying Blind, LLC related products and services. We trust you had a great summer and are enjoying the final three months of 2008. In this edition of the Flying Blind, LLC Newsletter we introduce you to a company who is providing thousands of electronic images of tactile graphics as well as some strategies for producing these graphics as hard copies. We showcase the new Alva Braille Controller in this installment of our EyePod TechnoCast, and we provide you with some details on Flying Blind, LLC’s first ever webinar designed to guide non-profit organizations through the process of obtaining ear-marked Federal Funding to support the services they offer. We also have some excellent bargains in our E-Blink Showcase. So make yourself comfortable. We hope that you will enjoy reading and listening to all that we have put together for you in this Volume of the Flying Blind, LLC Newsletter. As always, please feel free to e-mail me directly with comments, questions, or suggestions. In this edition of the FB-Eye Spotlight, we introduce you to VIEW International Foundation, Your Source For Tactile Graphics. VIEW International Foundation is pleased to make available a large number of tactile diagrams developed for use by college students. Initially this collection was only available on CDs. Schools may purchase all or part of the collection depending on their needs. To utilize the files in this collection, a school must have the free Adobe Acrobat Reader® software and a means for printing on and processing capsule paper. Schools and individuals can download the most current version of the free Adobe Reader® software here: http://www.adobe.com/products/acrobat/readstep2.html. There are 11,280 files in the complete collection. The complete collection is on ten CDs and sells for $259.00. Each individual CD will sell for $59.00. These prices include shipping and handling. The CDs are designed to run as a CD based product, and no installation is needed. To utilize these diagrams, they must be printed on capsule paper which is then processed with a machine like the PIAF ("Pictures in a Flash" from http://www.quantumtechnology.com.au/piaf) that activates the paper producing a raised image. The list below shows the CDs available and the number of images on each CD. Please don’t forget to mention that you read about VIEW in the FB-Eye Spotlight! Manufactured by Quantum Technology, this is a fantastic Braille writing tool which introduces the blind student to the fundamental necessity for developing braille literacy skills by reinforcing Braille writing with digital audio output. And, it’s priced at a comparable price to its mechanical predecessor, the Perkins Brailler. Larry Lewis will be speaking about the advent of accessible mobile screenreaders and refreshable Braille displays, and will be discussing how they can be customized to meet a vision impaired student’s and/or employee’s needs on campus and within the workplace. 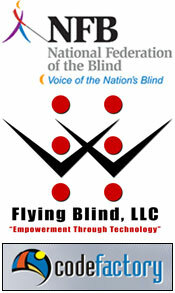 Flying Blind, LLC will also be demonstrating many of the technologies that it endorses in the exhibit area of the conference. Detailed information about the conference, along with contact information and a registration link, may be found at http://www.kanebrolin.com/. Larry Lewis is pleased to have been asked to speak at this conference to be held in the Chicago-land area, November 2-4, and will be presenting on Integrating Non-Visual Access Into A Library’s Gaming Experience. For registration details for this event, please visit http://gaming.techsource.ala.org/index.php/Registration. Finally, with a Presidential Election looming in the weeks ahead, we thought it would be important to provide an objective, non-partisan resource that might direct you to some information regarding both parties' positions on topics relating to persons with disabilities. The Ohio Legal Rights Service has prepared a side-by-side comparison chart of the presidential candidates' positions on disability-related issues. The chart is based on information from the candidates' Websites, their Senatorial Websites, and supplemented by other sources. Read the "2008 Presidential Candidate Positions on Disability-Related Issues" chart on the OLRS Website at: http://www.olrs.ohio.gov/prescompare.htm. Please note that Flying Blind, LLC does not endorse either candidate. This information is being provided solely for educational and informational purposes. Flying Blind, LLC is pleased to be participating in three different activities at the AER 2008 International Conference, July 22nd - 27th at the magnificent Mile Marriott in Chicago, Illinois. Come visit us in the Vision Cue (http://www.visioncue.com) Booth in the Exhibit Hall where we’ll be demonstrating Optelec’s ALVA BC640 and Easy Link Series of Wireless Braille Displays working with Code Factory’s Mobile Speak Symbian, Mobile Speak Smartphone, and Mobile Speak Pocket mobile screenreaders. We’ll also be showcasing these displays with today’s most popular desktop screenreaders as well as demonstrating Optelec’s Compact+ and Traveller+ low vision options. Flying Blind, LLC will also be located in the Evas (http://www.evas.com) and ICRC (http://at.icrcsolutions.com) booths where we will be demonstrating EVAS’s product continuum and discussing ICRC’s Consolidated Help Desk Support Services. Lastly, Flying Blind, LLC would like to invite you to attend a poster session entitled, "Wired for Business: Refreshable BRAILLE in Educational and Employment Settings" which will be conducted on Saturday, July 26th from 9:00 AM - 10:30 AM. In this presentation, we’ll discuss the necessity for refreshable Braille within the classroom as well as within competitive employment for those of us who are print impaired, focusing on the latest innovations in wireless Braille access, and how these innovations can be most effectively integrated into today’s classroom and job site. Until then, safe travels to Chicago, and be on the look-out for some exciting podcasts featuring some new and exciting products later this summer! Flying Blind, LLC Goes Hands-Free at NFB! Flying Blind, LLC is excited to be conducting the following presentation at the 2008 National Federation of the Blind Summer Convention (http://www.nfb.org/nfb/National_Convention_2008.asp) June 29th - July 5th, 2008 at the Hilton Anatole Hotel (http://www1.hilton.com/en_US/hi/hotel/DFWANHH-Hilton-Anatole-Texas/index.do). This presentation will showcase Guide Hands-Free, the industry’s first integrated speech output / screen magnification solution with built-in hands-free access via its speech recognition utility. Guide Hands-Free provides the user with a minimum of 21 exciting PC applications that the user may access either through a PC keyboard, or the sound of his / her voice. Mr. Larry Lewis will be putting these applications to the test, and will illustrate the ease by which this hands-free access provides an added dimension of productivity for the PC user who has challenges using a PC keyboard, or the user wishing to circumvent some of the graphical complexities of the Windows environment. 3:00 PM - 4:00 PM: "Exploring Guide Hands-Free! 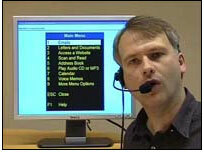 Integrated access to a PC using innovative speech recognition solutions!" For more information about this life changing alternative to PC access, please e-mail Larry.Lewis@Flying-Blind.com or call +1 (216) 381-8107. On Saturday, June 20th, Mr. Larry Lewis conducted a seminar on the various mobile options available for new and current users of accessible cellular phone technologies. To learn more about the many great courses offered by Hadley School for the Blind, please visit http://www.hadley.edu. Would You Like to Receive Text-Only Versions of the Flying Blind, LLC and Top Tech Tidbits E-Newsletters? And welcome to another edition of the Flying Blind, LLC E-Newsletter. I can’t believe that June is upon us, and that we’re gearing up for yet another summer. To heat things up for you, we have some exciting information in this newsletter. In this issue, we introduce you to Guide Hands-Free, the world’s first speech output/input and screen magnification productivity tool for the PC user who just wants to efficiently complete many of today’s popular tasks. In Volume 5 of our EyePod Technocast, we explore how the latest versions of Serotek’s System Access Mobile Network and HumanWare’s Victor Stream softwares work together to provide some innovative options for users of both products. As usual, we have some incredible deals on some refurbished Adaptive Technologies in our E-Blink Showcase. And we feature an incredibly rich online resource for today’s mobile phone user in our installment of FB-Eye Spotlight. So pour yourself a cold drink, turn on a fan or two, and enjoy this edition of the Flying Blind, LLC E-Newsletter. Welcome to Guide Hands-Free, the world’s first speech output/input screen magnification productivity tool. Looking for an application that enables you to complete today’s most popular computer tasks? Look no further! Guide Hands-Free gives you the option of using a menu driven keyboard command structure to read and write e-mails, surf the web, manage one’s finances, scan and read hard copy print, record memos, organize appointments and contacts, and so much more! Or, easily train Guide’s speech recognition software so that you can speak commands to your Guide-equipped PC as well as dictate text that Guide transcribes into your application of choice! Guide is for the PC user wishing to avoid the complexities of Windows, but still leverage the applications borne out of the Windows environment to perform relevant day-to-day tasks. It is also designed to provide hands-free, speech input capabilities to persons whose multiple impairments hinder them from using a PC keyboard. Also, feel free to contact Electronic Vision Access Solutions (http://www.evas.com/), the US Distributor of Guide Software by e-mail at inforequest@evas.com. Or by phone at +1 (800) 872-3827 and someone will be happy to follow up with you with more information; and don’t forget to mention that you read about Guide in the Flying Blind, LLC E-Newsletter! One BrailleNote PK for US$3,000.00! We are selling the world’s smallest Braille Notetaker at approximately 40% off its suggested list price! One PAC Mate Omni 420 for US$3,000.00! We are selling the world’s first self-contained Pocket PC with a Braille display for 30% off its suggested list price! One Juliet Classic Braille Embosser for US$1,000.00! Tried and true, the Juliet Classic makes a perfect embossing companion at a price you can afford! 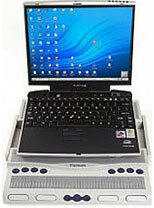 One Alva 570 Refreshable Braille Terminal for US$4,495.00! We are selling the globally acclaimed Alva Satellite approximately 50% off its suggested list price! One PowerBraille 65 for US$1,295.00! We are selling this longstanding Braille Terminal for a fraction of its original list price! One Braille Voyager for US$2,000.00! We are selling a Braille Voyager Braille Terminal for over 50% off its suggested list price! If you represent a manufacturer, agency, organization, or conscientious user of Adaptive Technology wishing to have your previously operated technologies represented in a future E-Blink ShowCase, please contact us at E-Blink@Flying-Blind.com to discuss placement within the E-Blink ShowCase for future Flying Blind, LLC E-Newsletters. To our AMIGOS in the Lone Star State! 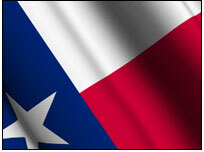 We make our second stop in Texas at the Region 4 Adaptive Technology Conference in Houston, June 23rd through 25th. Larry Lewis will be conducting a day-long workshop on June 23rd entitled, "Creating Successful Outcomes for Students with Visual Impairments". We’ll be exploring lots of different Assistive Technologies for your student’s "Technology Toolkits", so for those of you attending this conference, come ready for a jam packed day! We conclude the month in Dallas at the National Federation of the Blind 2008 Convention. We’ll be involved in lots of different activities at this convention, so stay tuned for more details forthcoming later this month! 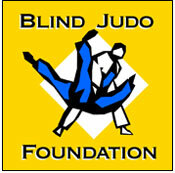 We hope you have enjoyed this edition of the Flying Blind, LLC E-Newsletter. For comments, suggestions, or questions about any of the content contained herein, please e-mail me directly at larry.lewis@flying-blind.com. 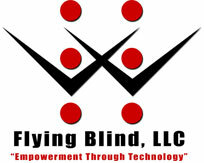 Look for product and conference announcements from Flying Blind, LLC in the coming weeks. Until then, we wish you a safe and enjoyable summer! And welcome to another edition of Flying Blind, LLC’s E-Newsletter. I trust that those of you in the United States remembered to set your clocks forward one hour and are off to a terrific week! From my perspective, Spring can’t come soon enough for those of us who live in Northeast Ohio, USA! In this edition of the Flying Blind, LLC E-News, the FB-Eye Spotlight showcases a company within this industry who is the only organization to solely offer comprehensive, consolidated, Help Desk Service for both adaptive and mainstream technologies to persons who are disabled. We also introduce you to a vision impaired business owner who celebrates over ten years of success serving persons who are vision impaired throughout Connecticut and surrounding States. This month’s E-Blink Showcase will feature some exceptional bargains for the avid Braille reader, and we’ll conclude with news about some Flying Blind, LLC Presentations that occur this month. I hope that you find this edition of the Flying Blind, LLC E-News both informative and enjoyable. For questions about any of the information covered in this newsletter, please feel free to e-mail me at Larry.Lewis@Flying-Blind.com. Also, your feedback regarding possible future material covered in these newsletters is always welcome. This installment of FB-Eye Spotlight showcases Integrated Concepts Research Corporation (ICRC). The Assistive Technology Support Center, managed by Integrated Concepts and Research Corporation (ICRC), is this industry’s only full service, comprehensive Help Desk, supporting all assistive technology products. The Help Desk provides toll free support for assistive technology on weekdays from 8:00 AM to 8:00 PM EST. ICRC has a proven track record supporting thousands of people with disabilities, and provides incomparable nationwide assistive technology Help Desk and user support services throughout numerous Federal, State, and private sectors. For more information concerning ICRC’s Adaptive Technology Support Center, please contact Matt Ater at (703) 488-3485, or at mater@icrcsolutions.com, and don’t forget to mention that you read about ICRC in the Flying Blind, LLC E-Newsletter! 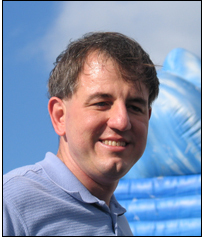 Larry L. Lewis, Jr., founder of Flying Blind, LLC, is both humbled and honored to be conducting a formal presentation at this years 2008 CSUN Conference. On Wednesday, March 12th at 4:20 PM, Lewis will be presenting "Wired for Business: Refreshable Braille in an Employment Setting". Lewis is excited to be discussing and demonstrating refreshable Braille strategies for successful outcomes, a topic about which he is most passionate, and invites you to join him for this informative presentation. It is with great pleasure that we share with you the following article about Charlie Collins, a vision-impaired business owner who owns and manages Vision Dynamics, a Connecticut-based facility that showcases a wide variety of today’s most prominent adaptive technologies. Collins’ story and his longevity in this industry serves as a great example of what one can accomplish regardless of his circumstances or disability.